Dharavi is Asia's second largest slum. It is a very congested place with narrow lanes and hordes of people. They compete with motor vehicles and push carts to get in or get out of the slum. One such lane has a church on it. Pastor Virendra has been running this small church for the past three years. The church is called 'Rehoboth'. He started with 40 members, and has now grown to 100 members. Most of the members are from the Kholi community, who are traditional fishermen. 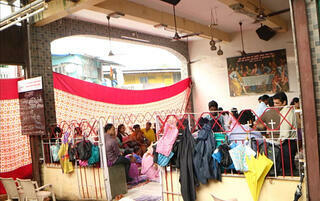 Virendra saw many things in Dharavi which he thought were important issues that women face. As Pastor Virendra shares his thoughts, it starts to rain. The church waits for members who may be stuck in various places, like bus stops. The church is just a large room with four pillars and no walls. A cloth is tied to the pillars and that is all that separates the space from the streets. There is a short grilled gate on one side, on which people hang their umbrellas as they walk in. Interestingly, most of the members are women. "I am a person who does not mind helping the poor. If I meet someone who is hungry, I will take them to a restaurant. 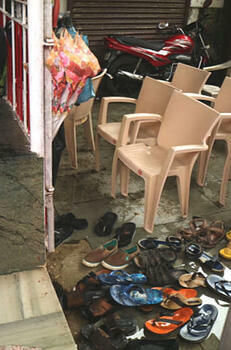 I felt I did not have the grace to do anything beyond this," says Virendra. His feeling of lacking ‘grace' to help more people in the Kohli community, changed when he met David Luke. David Luke is a World Vision India staff member who conducts Integral Mission workshops with church pastors from various denominations. They learn why working with the poor is a mandate of the church and also how to actually go about doing it. When Virendra told David about his church, which had mostly women who faced many struggles, David connected him to World Vision's Dharavi Area Development Program. He learned that these women could help themelves by forming Self Help Groups (SHG). The rain has reduced to a drizzle now and the church service starts. Music crackles a bit in the speakers, but the two boys on the bongo drums are not affected as they bring the songs to life. (Drums) The booming music they create attracts the attention of many passing by who pause to see what is going on. One passerby is holding an infant in one hand and a plastic cover with groceries in another. Though his burden seems heavy, he stops for a bit to observe what is happening. Pastor Virendra stops his singing, walks over to this father and ushers him to take one of the empty plastic chairs at the back. The man does not sit down, but he acknowledges the Pastor and continues to stand in the same place, unfettered by the drizzling rain. This reflects the open and inclusive attitude of the Rehoboth Church. They strive to bring in individuals with needs and empower them through a SHG. 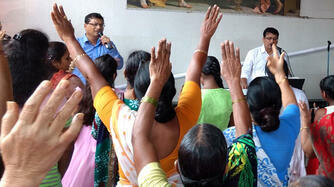 World Vision India trains the women in the church on the basics of forming and running SHGs. Pastors and church leaders also need to learn what an SHG is and how those with limited means can save money and deposit it in a bank. The Rehoboth Church started four SHGs with a total of 48 women. Each SHG has a unique name like Ruth, Sahara (Hindi word for support) and Samarpan (sacrifice). The 'Samarpan' SHG has 12 women in it. Sushila Patil leads this SHG. She used to sell fish and now she wants to start a dry fish business with a loan from her SHG. The SHG has saved 12,000 INR (about 200USD) so far. Sahara is another SHG that has 13 women in it, including Bharathi. Bharathi's husband left the family four years ago and she supports her son Shreyash, who is in kindergarten, by herself. The women meet in a different home once every month. The members hand over their small savings, which the leader collects and deposits in a bank. They have fellowship, sing a few worship songs and pray for each other. The women share their needs, sorrows and joys. They offer more than just words of encouragement to each other, they help each other. They hunt jobs for one another and look for homes for rent when someone in their group needs it. Bharathi’s SHG spoke to the community leader requesting space for her to set up a tailoring shop. The group advised her to spend her time wisely. As soon as she drops her son in school in the morning she needs to start her work. She needs to figure out a way to pay rent and get more customers. These women have felt the pinch from a lack of money. The SHG taught them to ask themselves, “How do we save?” It gave them confidence to start small businesses and take control of their lives. This grace is spreading as the SHGs grow and the church grows.